The Great Museum is a wonderful documentary dedicated to one of the most grand art museums in Europe. Johannes Holzhausen takes the beautiful Kunsthistorisches Museum and is able to increase it's beauty as a result of careful and respectful cinematography which is an absolute treat to behold on screen. The Great Museum is an absolute must for art history fans, but the film and the museum are both things of beauty and are able to be appreciated by everyone. The Kunsthistorisches Museum (Museum of Art History) in Vienna is a grand institution which has been open since 1872 and houses an incredible collection of art and historical artefacts. The Great Museum takes us behind the scenes to show us how curators maintain the contents of the museum and how they are constantly learning new things about the art already in their possession. The museum's staff are also faced with the task of attracting visitors so that they can meet their budget for the year and there is the inevitable task of how to make the museum seem more relevant to the 21st century. The Great Museum does the Kunsthistorisches Museum complete and utter justice. The beauty of the institution, which is already a magnificent piece of art in itself, is greater enhanced by this film. It is a triumph for a film to take something which is already of the greatest beauty and somehow increase this beauty by allowing people to see it from the most extraordinary angles as a result of wonderful filmmaking. There is a tremendous amount of beauty throughout starting from the beginning shot and it is absolutely mesmerising seeing these astonishing pieces of art like you never have before. The Kunsthistorisches Museum houses some amazing pieces of artwork and pieces of history and these objects in themselves are incredible to see, but on film we see them in a way which we probably wouldn't even see them physically at the museum. The way in which the frescos are seen as they are being maintained and the imperial crown as it is being inspected are visions you would only be able to see in this film, as you would not see them in the same way the film is allowing you to in real life. The lighting in particular scenes also allows the art to be seen from a different viewpoint, giving it different feeling and meaning. The cinematography methods used to put the museum on show are all extremely respectful, as is very important when dealing with such an Austrian cultural landmark. Vienna, although not much of it is seen, is also presented in incredible fashion. Early in the film there is a beautiful panning shot of Vienna which shows the beauty the city itself holds. In every scene which is set in a room of the museum that has a window, the camera positions itself carefully so you can see the view of Vienna outside the window. 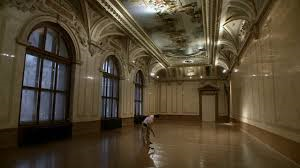 In the film, the museum is a living, breathing organism and it is treated as though it is the human subject of a documentary. It's personality is explored with great depth, as are the external and internal influences that affect it's day to day life. The film is intriguing and awe inspiring. It takes you behind the scenes to witness scenes such as upkeep of their historic pieces and the arrival and preparation of new and amazing pieces. What makes The Great Museum a documentary like no other is it's method of informing it's audience. Director Johannes Holzhausen chooses not to have the curators tell the audience how they do things, but rather show them and the viewer learns much from their conversations with others and their actions. A great deal is learnt over the course of the film about the museum itself and many pieces of art housed inside it. The Great Museum is made with a huge amount of care and a great deal of love is displayed throughout the film. There is an obvious love for the museum shown by Holzhausen in the production of the film with the commitment to bringing the best of the museum to the screen in the most extraordinary way, but there is love in everyone who works for the Kunsthistorisches Museum. This love transfers to the audience as you cannot help but feel a great fondness for the museum. During the film, the staff try to look at more effective ways in which to attract the public and tourists to the museum. This film is an excellent form of publicity for the Kunsthistorisches Museum and one can only speculate at the advantageous ways in which it will work for them. The Great Museum is a documentary which is truly one of a kind. It stays away from the normalities of the regular documentary and creates a beautiful film about a beautiful place.